You should be familiar with the Provisioning Services Console; specifically, assigning vDisks to target devices and viewing stores. Single PVS server. All vDisks held in one location on its disc. Please note, this guide is not a complete substitute for reading and understanding the Provisioning Services 7.9 documentation. 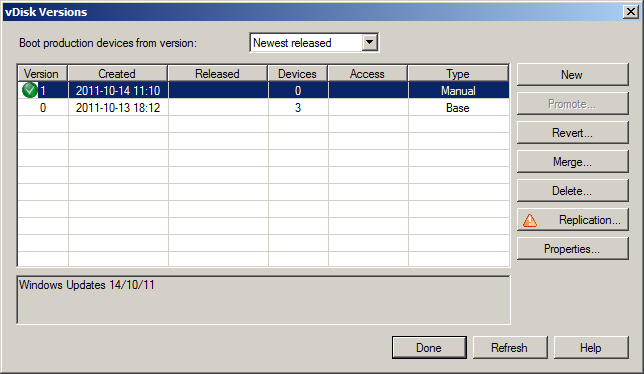 PVS 7.7 and later support .vhdx files as well as .vhd (you make the decision which to use when creating a new vDisk). If you use .vhdx files, your difference files will be .avhdx whereas if you use .vhd, they will be .avhd. vDisk - a virtual hard disc which can be used by multiple target devices. The main vDisk file is called vDiskName.vhd or vDiskName.vhdx. This is accompanied by a vDiskName.pvp file which contains settings for the vDisk. Both files must be copied or moved together. The file called vDiskName.lok can be ignored. The files will tend to be in a folder on a hard disc on the provisioning server(s). Multiple version of the vDisk can be maintained by using a file that stores the differences from the base vDisks. The base version is version 0. Version 1 will have files vDiskName.1.avhd (or vDiskName.avhdx), vDiskName.1.pvp and vDiskName.1.lok. Store - a collection of vDisks which can be served by one or more servers. If served by multiple servers, the paths set for the store must be available on all servers (they can be overridden for specific machines). Replication - a means by which a folder of data is maintained across multiple servers. 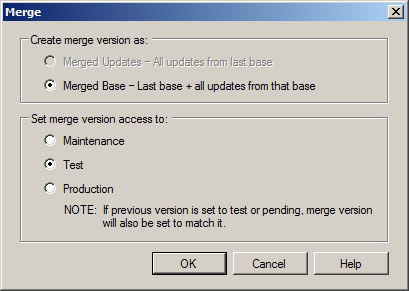 Versions - a vDisk can have multiple versions. Each version can be in production, test or maintenance modes. Maintenance is read-write, production and test are read-only. Production device - standard Target Devices which will be offered a shared mode vDisk of a specified version (usually the newest). Maintenance device - a specific Target Device which is only used to work on updating vDisks. Generally this will be a virtual machine. This will be offered the read-write private copy of a vDisk. A menu will be presented at boot time with the various versions. Firstly a base vDisk is created in the usual way. It should be bootable both on physical hardware (if required) and as a VM (on XenServer). The vDisk is set to shared mode. At this point, target devices can be assigned the vDisk and can be used. Replication can be used to make the vDisk available from multiple PVS servers to allow for load-balancing and high-availability. The vDisk does not need to have a version name embedded in its name (i.e. XenApp or Windows7 is fine). If the Access column is empty, then that version is in standard shared mode, i.e. Production. You need to have a maintenance version of the vDisk. If one is not already present, then click on New. In the screenshot above, you will see that version 1 is in maintenance mode. 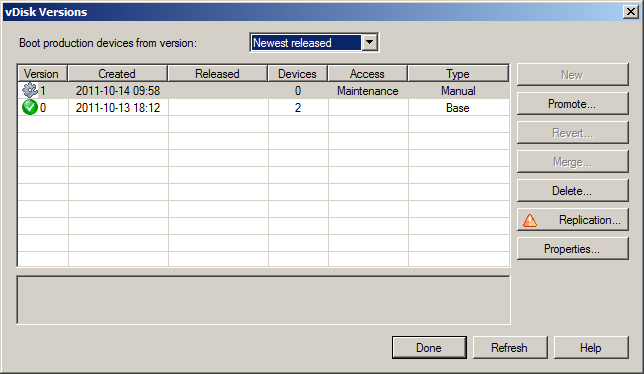 Locate your Maintenance Target Device in the PVS console. This will be called something like XenAppMaster. Check it is in Maintenance Mode. If it is not, right-click on it, choose Properties and set the Type to Maintenance. Boot the Maintenance Target Device. You will be prompted to choose the version to boot. If you have more than one provisioning server then you will need to replicate the vDisk version. On the server where you created the new version of the vDisk, you will find three files per vDisk version which will be named after the vDisk name followed by the version number (e.g. vDiskName.1.avhd for version 1). These will be found in the store location the server is using (this store is usually located on a local harddisc partition and will be called something like vDisks - you can check the properties of the store within the PVS console to see the physical location). One of these files will be have a .pvp file extension, another will have a .avhd file extension and the final one will have a .lok file extension. To replicate the disk, copy the .pvp and .avhd file to all other store locations (do not copy the .lok file). If you have replicated the vDisk to other servers/locations then you can check the status of the replication within the PVS console. To do this, right click on the vDisk within the store and choose 'Replication status'. This is great for maintenance purposes and for disk space usage, but can slow down access as 4 files need to be accessed to get that version's data. As a Merged Base version is a standalone .vhd file, it may be copied to form a brand new vDisk.